The United States of America, is gifted with so many renowned universities. Withever you choose to attend be it private or public, be rest assured that the courses and schools are fully accredited, and very importantly, a study here gurantees a global degree recognition. 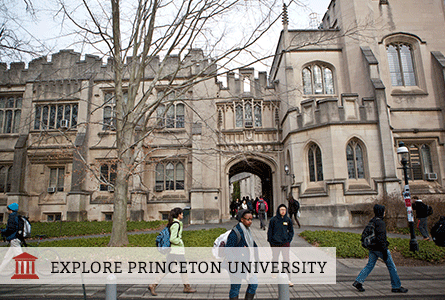 One of the highly rated private ivy schools in the USA, is the Princeton University. Princeton Universityis a private Ivy League research university in Princeton, New Jersey. Founded in 1746 in Elizabeth as theCollege of New Jersey, Princeton is the fourth-oldest institution of higher education in the United States and one of the nine colonial colleges chartered before the American Revolution. The institution moved to Newark in 1747, then to the current site nine years later, where it was renamed Princeton University in 1896. Princeton runs programs for all levels. Ranging from undergraduate to doctoral programs. Undergraduate and graduate instruction in the humanities, social sciences, natural sciences and engineering. It offers professional degrees through the Woodrow Wilson School of Public and International Affairs, the School of Engineering and Applied Science, the School of Architecture and the Bendheim Center for Finance. Princeton university operates a semester-based academic calendar. Princeton University’s ranking in the 2018 edition of Best Colleges is National Universities. Princeton, among the oldest colleges in the U.S., is located in the quiet town of Princeton, New Jersey. Within the walls of its historic ivy-covered campus, Princeton offers a number of events, activities and organizations. Princeton includes highly ranked graduate programs through the Woodrow Wilson School of Public and International Affairs and School of Engineering and Applied Science. One unique aspect of Princeton’s academic program is that undergraduate students are required to write a senior thesis, or for students in some engineering departments, take on an independent project. Notable alumni include U.S. President Woodrow Wilson, model/actress Brooke Shields and former first lady Michelle Obama. Applying early enough is important so as to stand a chance of gaining admission. When applying to Princeton University, it’s important to note the application deadline is Jan. 1, and the early action deadline is Nov. 1. Scores for either the ACT or SAT test are due Jan. 1. It is most selective, with an acceptance rate of 7 percent and an early acceptance rate of 18.6 percent. The application fee at Princeton University is $65. At Princeton University, 60 percent of full-time undergraduates receive some kind of need-based financial aid, and the average need-based scholarship or grant award is $47,497.